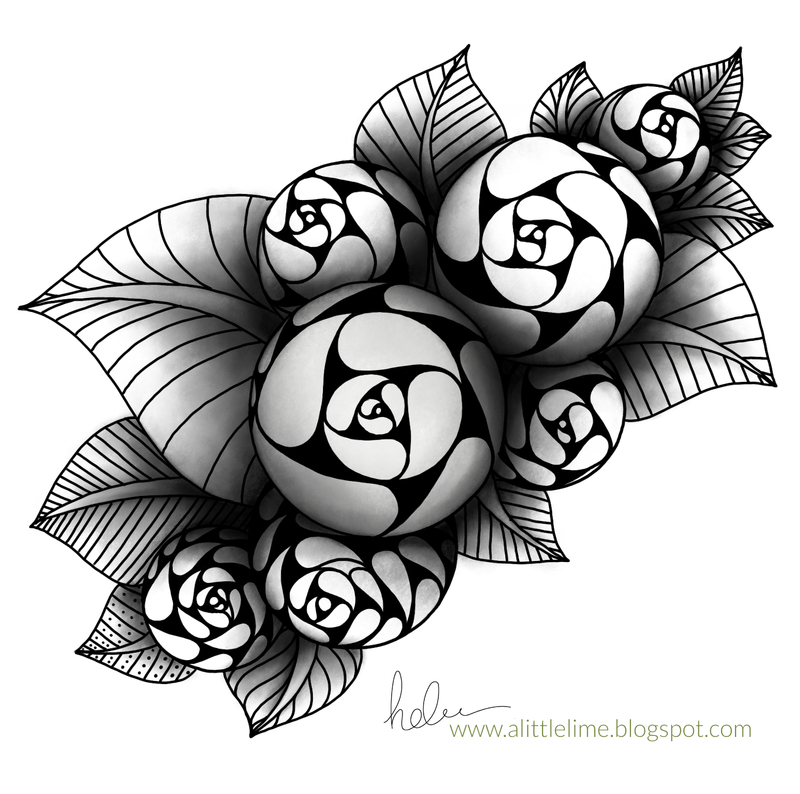 I think these rose patterns have been a bit of a flash back to 90's folk art painting. Pretty sure I'm done now. As a rare treat (in which you may read "treat" to actually mean "cruel and unusual punishment"), I am subjecting you to some narration in this video. It's been a few years since I've talked in a video as I really hate my voice - I pretty much "broke" it 10 years ago when I had whooping cough and after months of intense nightly coughing I damaged my voice permanently, practically losing it for a year. It's never been the same since. Though, to be fair, it was pretty awful before too. hahahaha. In some other "blog" news, I discovered (thank you Bonnie!) that if you try to reply to my blog feed emails they have been going to a noreply email address. Not sure how this happened, but I have changed the setting so you should now be able to reply to my emails again and they will come to me rather than going to the big interwebs noreply mailbox. You have all given me a lot to think about with regard to full or update editions to the pattern folio each year. I did want to mention though, if you prefer to print your copy but don't like wasting all that paper - you can just print selected pages (i.e. only the new patterns). The exact settings to do this depend on your specific printer, but it is generally very easy to do. Fabulous video & clear instructions Helen. Thank you. Thank you for the step out for this beautiful pattern! But if it's a hassle, I have no problem at all drawing alone. I learn just as well without. I enjoy your voice and adore your accent. But don't everyone hate hearing their own voice? The reply to email in the newsletter is still broken. I get a 404. I think the video link may have something to do with your email/server settings - maybe it gets stripped out - I know that happens for some and I used to put a note under the videos to visit the website - I might have to go back to doing that. When you get a 404 when replying, it that when you hit return in the email, or try to use the "email the author" button (I've now removed those links, but a simple return/reply should work). you have another winner here! I've been playing with string rose, now I shall move on to this one <3 thank you! I love this pattern, Helen. I personally prefer your spoken voice. I find it helpful to hear what you say and watch as the pattern unfolds. Thanks so much. Great video and instructions. I like the narration but can easily work with captions! Thank you for beautiful work! Helen - Love your work. If you turn on community contributions on your YouTube channel, I would do some captioning for you to get kickstarted. As the channel admin, you have the final authorization to post it to subscribers. The only thing you need to do in prep is to talk while the camera is running. FYI - Including closed captions on your channel improves the hit rate when people are doing searches. That is not true if the captions are just a picture of words. I find it most helpful to hear you speaking at the same time as watching you drawing. I can't concentrate with my eyes on two parts of the screen at the same time - I either watch the drawing or have to read the captions, trying to do the two simultaneously just doesn't work for me. But as has already been said, everyone is different & learns in different ways. Thanks for all you do with patterns & videos - yours is one of the few blogs that I've been visiting continuously over the last 5 or 6 years. I usually prefer captions BUT, I enjoyed hearing your voice (love the accent :-) ! ) AND, you do it right - brief, simple and clear. Most people spend too much time talking and the video drags on. Your's is just right. Thank you. haha, yes, I think I am going to choose to view my voice as exotic from now on, as to most people watching the videos it is an "accent". I do try to keep the videos pretty quick and to the point as with the constant bombardment of media in our lives now, our time seems to have become even more scarce :) Thank you! h.
so what is wrong with your voice? Hugs! Thanks, Helen, for such an impressive and beautiful tangle! Does it ever stand out! The video helped a great deal. I don't think I care much whether voice or text, but have to agree with Ellen Schon. I like info fast and to the point. Just the way you do it. No need to change anything! Thank you Helen. For me hearing your voice gives an extra "calming" effect to the whole drawing process. By the way: your voice is wonderful and unique! It is part of who you are. One to treasure and I love the sound of it. Thank you for the roses.... what a fun tangle this is! Bless you. Just FYI, I am not experiencing any of the issues others have mentioned here, so I believe those problems are a result of settings, bandwidth, internet connection speed, etc. on the user end. Hi Jan. Thank you! I really love being able to share my creative process with you and honestly feel that I am the one who gets the most out of it :) That others also enjoy it is a wonderful thing. I have decided to view my voice as an exotic accent, as for most of the people hearing it in this format it is an accent. Unfortunately I cannot shield my family and friends from the truth! hahahaha. I do think that you gain a bit more insight to the process with spoken instructions, so it is my aim to try and do more like this. 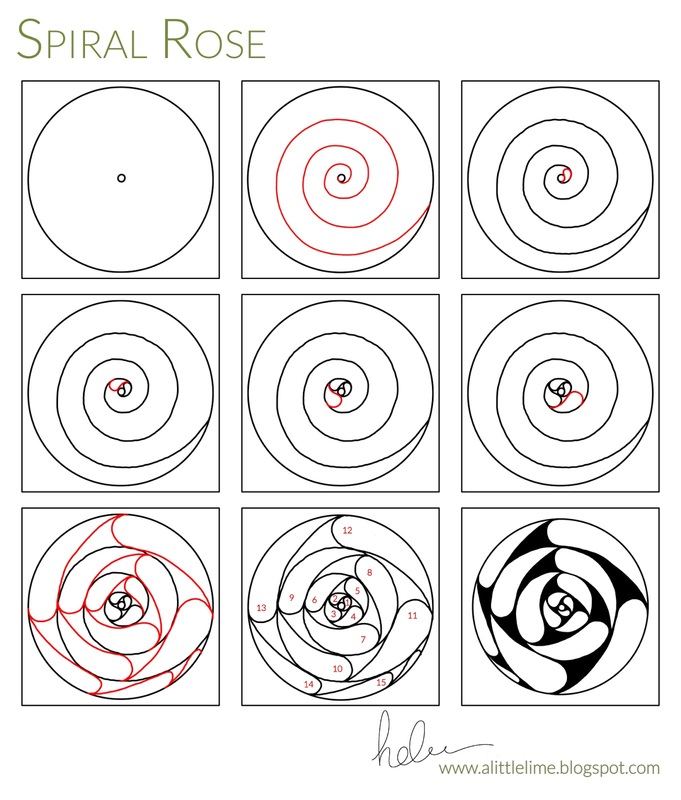 Helen, I love your spiral rose . The video with narration is my preferred but happy with either. I look forward to your creative inspirations in my email box. Thank you for sharing. Please tally me on the side of those who love you AND your voice! It sounds exotic here in Massachusetts, I assure you. (I live near Boston, where there is also an"exotic" accent available! I like hearing the explanations as you go along...you posted at least one with no voice or written words at all and it was OK, but not so helpful as with words! I love the new pattern and I'm so glad it has come with a video. Your voice overs are perfection. I think an Australian accent is beautiful and there is nothing scratchy about your voice. It is little like a spoken song. Wonderful in every way. I have several of your e-books and wish I could hear your voice as I turn the pages. Since I print your books, (I'm old, printed is easier for me), that won't be happening any time soon. I can now "visulaize" your voice while I'm trying to recreate your lovely patterns. P.S. Love your farm too.